Trigger- happy Jamaican cops carried out 590 shooting last year. MAY PEN, Jamaica (AP) — It's been nearly a year since Sevina Giderisingh's 20-year-old son died in a confrontation with a police officer on the dusty outskirts of this struggling Jamaican city where jobs are scarce and crime is frequent. The only explanation she's gotten from detectives in gritty May Pen was that an officer shot her eldest son in self-defense one afternoon last June after he was accused of stealing a taxi. But she says a witness told a starkly different story: Her slender son, Alphanso, was unarmed and cold-bloodedly shot while on his knees, begging for his life. "Even if he got involved in something bad, my son had the right to go to court. This killing was a crime, but where's the punishment?" asked a teary-eyed Giderisingh, clutching her son's high school graduation photo while standing on a dirt road by parched fields where he died. 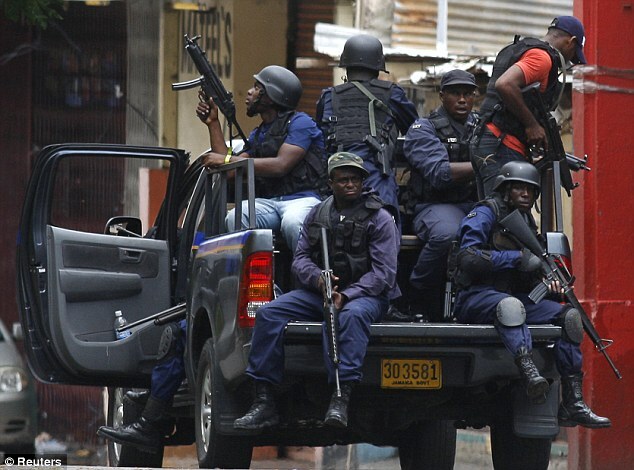 It's a not uncommon event in Jamaica's poorest neighbourhoods, where police and soldiers regularly impose dusk-to-dawn curfews and slum-dwellers say security forces behave as if they are at war. Allegations are rampant of lawmen shooting indiscriminately, planting pistols next to dead bodies and collecting spent shells. Senior commanders of the Jamaica Constabulary Force have long dismissed accusations of unlawful killings and crime scene manipulation as exaggerated, noting that officers work in dangerous gang-ridden environments where illegal firearms are numerous. The majority of last year's 1,200 homicides were committed with illegal guns and about a dozen officers are killed each year. But in an unprecedented investigation, 27 police officers across the island are now facing charges of murder brought by a commission created by Parliament in 2010 to probe allegations against security forces. Eight of the officers are based in a single police division that includes Clarendon parish, where May Pen is the capital. The Independent Commission of Investigations says at least nine other slayings listed by police as unsolved homicides committed by unknown gunmen in Clarendon may actually involve shootings by officers. One case saw a masked assailant fatally shoot a previously wounded suspect lying in a hospital bed. After receiving information "from a variety of sources" and investigating the cases, "there is a great reason to believe they were indeed police-involved homicides," said Terrence Williams, who heads the commission. The death of Giderisingh's son is among cases being looked at by the commission, but no determination has been made about what happened and no charges have been filed. Authorities have declined to comment on the killing. Susan Goffe, director of Jamaicans for Justice, a civic group founded in 1999 to be a watchdog for state abuse, said the allegation of fake reporting "raises the question of whether there are many more persons being killed by police than are being reported." Since 2000, security forces have reported killing nearly 3,000 people on this island of 2.7 million. Last year, 258 people were slain by law enforcers in the crime-plagued Caribbean country that the U.N. Office on Drugs and Crime says has the globe's sixth highest homicide rate. In comparison, police fatally shot 13 people last year in Chicago, a U.S. city with the same population as Jamaica. Almost all of the dead from police shootings have been written off as armed criminals killed in shootouts. A tiny percentage of the cases ever made it to the courts, and only one Jamaican officer has been convicted of an unlawful killing since 2006, according to a 2013 human rights report by the U.S. State Department. The result is that many Jamaicans say they live in dread of both criminals and police. In a sign of the fear in Clarendon parish, most people refused to identify themselves by name when criticizing police, out of fear that law enforcers would hold it against them. "How do I know something bad won't happen to me if I speak out?" asked the mother of one young man purportedly slain by an officer facing murder charges. Still, Jamaica's high rate of violent crime over the past 30 years also brings public support for tough police tactics. Quite a few islanders believe it is better if officers kill "bad men" rather than rely on Jamaica's inefficient court system, where the conviction rate for homicides is roughly 5 percent. "This country needs rough police who aren't afraid of bringing the fight," taxi driver Ernest Johnson said as he bought a drink from a street vendor near the May Pen police headquarters. Owen Ellington, head of the Jamaica Constabulary Force, said he is eager for the commission's investigation to be concluded, saying many upstanding officers are having to work under a "cloud of suspicion." He agrees police have a "trust deficit" with much of the population, but says perceptions are improving as more rogue officers are booted out and reform efforts are broadened. In recent years, authorities also have sought to address citizens' concerns by encouraging community-oriented policing in slums where longstanding accusations of police "death squads" linger. Goffe, at Jamaicans for Justice, believes the commission's investigations have the potential to be "a turning point" for the island, if the public prosecutor and courts follow through in fairly trying police accused of crimes. In May Pen, Giderisingh agrees. "I am praying that justice will be done," she said. "Not all police are bad, but the bad ones, they need to be cleaned out for the good of the country."